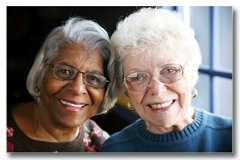 There are many Town and community programs, services and resources for adults aged 55 and over. Staff are regularly connecting with community partners and service providers to ensure relevant and timely udpates are shared with residents. Seniors Day | Connecting seniors to people, programs and possibilities. June 5, 2019 | 10 a.m. – 3 p.m.
Join us for a day of information, resources and giveaways. Meet old friends and make new ones! Need a ride to Seniors Day? The Town has partnered with Caledon Community Services to provide transportation to and from Seniors Day. Caledon residents are eligible for a discounted rate of $2 per person, one way ($4 per person, round trip). Every year we review the Adults' 55+ Strategic Plan and provide updates on progress and achievements that happened during the respective year. Please find the Annual Report for the 2018 year below. A New Year’s resolution is a tradition, most commonly found in the Western Hemisphere, in which a person resolves to change an undesired trait or behavior, to accomplish a goal or otherwise improve their lives. For those who do not wish to make resolutions, here are 21 Rules for Good Aging that can help make this year the best one ever! Get your Groceries with Caledon Community Services Transportation! Orangeville: Tuesday mornings & Thursday afternoons. The Region of Peel is offering residents FREE basic dental care for seniors who meet the qualifications. Statistics Canada reports that Canadians living over the age of 65 have a higher level of life satisfaction according to a new study released. A new Community Paramedic Program launched by Dufferin County Paramedic Service, in partnership with the Central West Local Health Integration Network (LHIN) and Headwaters, is making it easier for seniors, the disabled and people with chronic illnesses to get the care they need. The program provides patients with an alternative to their family doctor, walk-in clinics and the Emergency Department by offering preventative at-home health care visits. There is an exciting new program for seniors in the Dufferin Region! Health TAPESTRY works to help people stay healthier for longer in the places where they live. We do this by bringing together health care teams, volunteers, the community and technology. Health TAPESTRY was developed and is led by the McMaster University Department of Family Medicine, partnering with the Canadian Red Cross and the Dufferin Area Family Health Team. As a trained volunteer, you’ll connect with clients in their home to gather health and social information using an iPad and web applications and to discuss life and health goals. You will then relay this information and foster connections between the client and the community resources that will help them stay healthier longer. This is a flexible volunteer opportunity in which you will help improve the lives of older adults and be part of creating a healthier and more sustainable community. Like many communities in Ontario and across the world, demographic shifts are expected and the Town of Caledon is prepared to cater to the changes that come with an aging population. The Adults 55+ Strategic Plan is a Council approved strategy that will help implement the tools and resources needed for Adults over the age of 55 to age in place. A Task Force is a group of individuals, appointed by Council, assigned to a particular Project undertaken by the Town. The Seniors Task Force meets as required by staff and follows an informal approach to achieve the desired outcomes. Each Task Force adheres to the Terms of Reference approved by Council. Summary Notes and Task Force Meeting information will be posted as made available. The Ministry supports, develops and delivers public services to improve the quality of life for seniors and helps them lead safe, engaged, active and healthy lives. The goal of universal design is to allow occupants to live safely, comfortably and independently. The new Universal Design Policy addresses a gap for seniors and others with accessibility issues. It allows those with changing needs to modify their home as needed, easily and cost-effectively. The purpose of the Age-Friendly Planning Study is to help make Caledon more age-friendly by developing appropriate Official Plan policies. Every person in Ontario should be able to benefit from the opportunities the Province has to offer, no matter their age. The Province is taking action to make sure that all seniors are able to access the support they need at every stage of their life.